Women suffragists in America mounted vigorous campaigns to gain the vote. 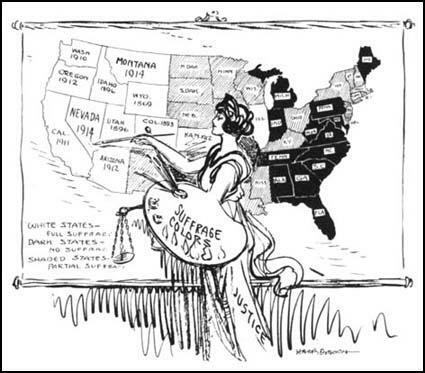 They tended to concentrate their energies in trying to persuade state legislatures to submit to their voters amendments to state constitutions conferring full suffrage to women. Individual states gradually yielded to these demands. In 1893 women got the vote in Colorado, followed by Utah (1896), Idaho (1896), Washington (1910), California (1911), Arizona (1912), Kansas (1912), Oregon (1912), Illinois (1913), Nevada (1914) and Montana (1914). 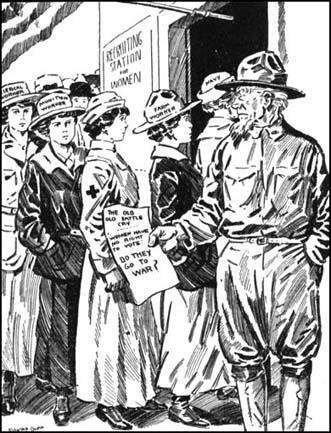 The First World War had a dramatic impact on the lives of American women. With so many men fighting at the front, women had the opportunity to show that they were capable of doing the kind of jobs that had traditionally been done by men. Also, the economic boom that followed the war enabled a lot of women to retain these jobs when the men returned from the war. The mass-production of washing machines, electric irons and vacuum cleaners reduced the time spent on domestic chores and gave women the opportunity to go out more. One of the most popular leisure activities during the 1920's was dancing. However, these new dances, which tended to involve a lot more physical contact than had previously been the case, were severely criticised by the older generation. Women who live in the country sweep their own dooryards and may either feed the refuse of the table to a flock of chickens or allow it innocently to decay in the open air and sunshine. In a crowded city quarter, however, if the street is not cleaned by the city authorities no amount of private sweeping will keep the tenement free from grime; if the garbage is not properly collected and destroyed a tenement house may see her children sicken and die of diseases from which she alone is powerless to shield them, although her tenderness and devotion are unbounded. In short, if women would keep on with her old business of caring for her house and rearing her children she will have to have some conscience in regard to public affairs lying quite outside of her immediate household. The individual conscience and devotion are no longer effective. The statement is sometimes made that the franchise for women would be valuable only so far as the educated women exercised it. This statement totally disregards the fact those those matters in which women's judgement is most needed are far too primitive and basic to be largely influenced by what we call education. I regard the extension of suffrage to women as vitally essential to the successful prosecution of the great war of humanity in which we are engaged. It is my duty to win the war and to ask you to remove every obstacle that stands in the way of winning it. They (other nations) are looking to the great, powerful, famous democracy of the West to lead them to a new day for which they have long waited; and they think in their logical simplicity that democracy means that women shall play their part in affairs alongside men and upon an equal footing with them. I tell you plainly as the Commander-in-Chief of our armies that this measure is vital to the winning of the war. For some months past the pages of our more conservative magazines have been crowded with pessimistic descriptions of the younger generation, as seen by their elders and, no doubt, their betters. Hardly a week goes by that I do not read some indignant treatise depicting our extravagance, the corruption of our manners, the futility of our existence, poured out in stiff, scared, shocked sentences before a sympathetic and horrified audience of fathers, mothers, and maiden aunts - but particularly maiden aunts…. The acceleration of life for us has been so great that into the last few years have been crowded the experiences and the ideas of a normal lifetime.... We have been forced to become realists overnight, instead of idealists, as was our birthright.... We have been forced to question, and in many crises to discard, the religion of our fathers. We have seen hideous peculation, greed, anger, hatred, malice, and all uncharitableness, unmasked and rampant and unashamed. 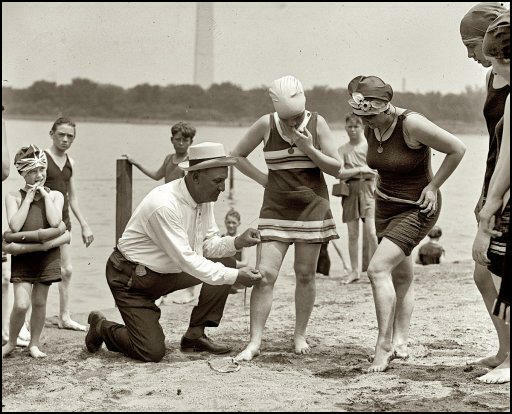 In 1922 Colonel Sherrill, Superintendent of Public Buildings and Grounds in Washington, issued an order that swim suits not be over six inches above the knee. 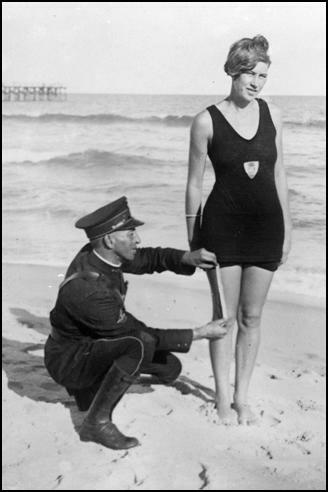 In July, 1920, a fashion-writer reported in the New York Times that "the American woman ... had lifted her skirts far beyond any modest limitation", which was another way of saying that the hem was now all of nine inches above the ground. It was freely predicted that skirts would come down again in the winter of 1920-21, but instead they climbed a few scandalous inches farther. 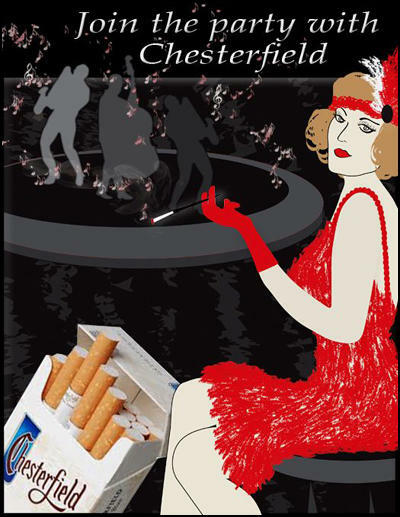 The flappers wore thin dresses, short-sleeved and occasionally (in the evening) sleeveless; some of the wilder young things rolled their stockings below their knees, revealing to the shocked eyes of virtue a fleeting glance of shin-bones and knee-cap; and many of them were visibly using cosmetics... Some of them, furthermore, were abandoning their corsets. "The men won't dance with you if you wear a corset", they were quoted as saying.... Supposedly "nice" girls were smoking cigarettes - openly and defiantly, if often rather awkwardly and self-consciously. Jane Addams launched scores of initiatives from her community house base in the slums of Chicago. She worked in the Consumers' League and the Women's Trade Union League, setting state and national agendas for reform on factory hours, sanitation, pure milk, food and water, and health care. She seconded the nomination of Teddy Roosevelt at the 1912 convention of the Progressive party, the only big party to support women's suffrage. She backed the founding of the National Association for the Advancement of Colored People (NAACP). And she crusaded for world peace. In 1931 she shared the Nobel Peace Prize. Everyone, it is to be supposed will agree that the foundation of feminism is belief in women as human beings ... It was the perception of these curious creatures hampered throughout their lives by dozens of rules for respectable female behaviour - that these weak, ignorant, garrulous, fanciful, submissive creatures were almost the opposite of what they seemed. All these qualities, which seemed so inherently feminine, must suddenly be regarded as merely the results of environment and training. After the First World War, the conduct of young middle class girls or flappers shocked parents. They cut their hair short, smoked in public, wore rouge and lipstick, and short skirts. They went to movies and cocktail parties in cars, and stayed out late dancing the Charleston, Black Bottom and Heebie Jeebies. For the well-off, this was an age of frivolity and gaiety, when young people were anxious to forget the past and to cast aside all social restraints. "Your complexion," said the make-up man, "is rich and rosy, and your eyes are wide and full"
I was rather relieved. Everything seemed to be all right. "Your hair line is good, too," he said. "No widow's peak. No wild hair to be taken out" I breathed a sigh of relief. "But," he said, "we'll have to pull out all your eyebrows! The line is bad". "You'll have to have new teeth," he said. One of my front teeth is a little short. To repair that and to straighten the line, he wanted most of my upper teeth taken out and replaced. Finally, a dentist was able to make a shield that went over the short tooth, and that, they concluded, after six men stood around and made me smile at them for fifteen minutes, would be satisfactory. Then, with four or five men holding lights around me, the director said: "Now we're all right, Miss Sullavan. We'll shoot the test. Just be natural. Turn your head. That's it. Smile! Smile! Cut!" Question 1: Explain the meaning of sources 2 and 5. Question 2: Use the information in this unit to explain why women wanted and received the vote. Question 3: In source 9 John Franklin Carter wrote: "I would like to observe that the older generation had certainly pretty well ruined this world before passing it on to us. They give us this thing, knocked to pieces, leaky, red-hot, threatening to blow up; and then they are surprised that we don't accept it with the same attitude of pretty, decorous enthusiasm with which they received it." What evidence is there in source 12 that the young were rebelling against the values of their parents?" Question 4: Explain what is going on in sources 8, 10 and 13. Question 5: What does source 17 tell us about social attitudes in the 1920s? Question 6. Why would the woman who wrote source 15 be concerned about the contents of source 18.